A pair of very special speakers took part in a conference devoted to 3D bioprinting in space at the Skolkovo innovation centre on Wednesday. 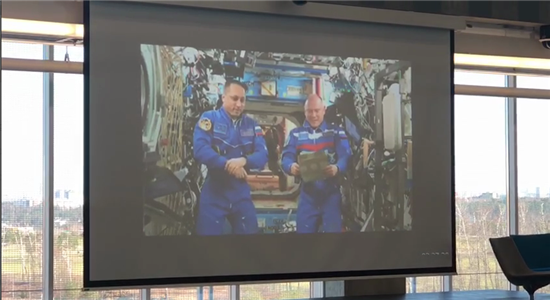 Two cosmonauts – commander Anton Shkaplerov and flight engineer Oleg Artemyev – answered questions and interacted with the audience at Skolkovo’s Hypercube, though they weren’t present in Moscow, or even on Earth. They were taking part via live videolink directly from the International Space Station. Cosmonauts Anton Shkaplerov (left) and Oleg Artemyev address Skolkovo from the International Space Station. Photo: Sk.ru. While both Shkaplerov and Artemyev – and another colleague who floated past the camera during the question and answer session – appeared to be in fine health, spending time in space is known to present a whole range of health hazards to the human body that increase with the length of time a person spends in space. Monitoring and closely studying astronauts and cosmonauts before and after they spend time in space is only one way of learning about the effects on their health. A less risky way that does not require humans to spend so long in space is to examine the effects on cells grown directly in space. To this end, Skolkovo resident 3D Bioprinting Solutions – one of the conference’s organisers – is preparing to send a bioprinter to the Russian sector of the International Space Station (ISS) before the end of this year. “Currently, when biofabrication takes place on Earth, subject to gravity, developers have to use additive technology, using printed layers, in which the construct grows layer by layer,” said Skolkovo vice president for innovations Kirill Kaem, opening the conference and explaining the idea behind the space bioprinter. “This has led to attempts to recreate conditions of microgravity using magnetic fields, in which the construct can be printed not in layers, but the organ can be formed right away [in a way that more closely resembles how cells grow inside the human body]. Magnetic fields can be used to try to imitate microgravity, but the ideal place to carry out such experiments is space, where there is microgravity,” said Kaem. Vladimir Mironov, chief scientific officer at 3D Bioprinting Solutions. Photo: Sk.ru. 3D Bioprinting Solutions has teamed up with RosCosmos, the Russian state space corporation, to make that dream a reality. Its printer will print cell tissue and organ constructs directly in space, enabling scientists to study the effect of space radiation on the human body. The Skolkovo biomed startup, which made headlines around the world in 2015 when it printed a functioning thyroid construct and transplanted it successfully into a mouse, is now preparing to send into space the cell tissue needed to print a mouse’s thyroid gland and human cartilage, cofounder Usef Hesuani told Sk.ru in a recent interview ahead of the conference. “These are the types of tissue we are actively working on in our lab [on Earth], so they provide us with reference points,” said Hesuani. The thyroid gland is particularly sensitive to the effects of radiation, making it a good subject for study in space, but Hesuani says it is crucial to study different kinds of tissue. The first experiment will take place over three days, and the results will be analysed over the following two months, but the automated organ printer – named OrganAut – will remain on board the ISS as part of the apparatus available in the Russian sector. The idea of sending up a bioprinter to the ISS was first voiced by one of the foreign speakers at the second Skolkovo conference devoted to 3D bioprinting, now in its fifth year, Hesuani told guests of Wednesday’s conference, the first to be devoted specifically to bioprinting in space. “The seed of that idea was sown at the second conference, and the fact that we are currently preparing to send our printer up to the ISS is a result of that conference,” said Hesuani, expressing hope that this year’s conference would yield fresh ideas too. The aim of the conference was for scientists working in this field to present their findings, and for 3D Bioprinting Solutions to show their colleagues what opportunities will soon be appearing on the Russian sector of the ISS: any lab in the world will be able to carry out experiments using the OrganAut, either by using 3D Printing Solutions as an operator, or by working directly with Roscosmos. Elena Andreeva of the Institute of Biomedical Problems devoted to space medicine presented a series of experiments that the institute has carried out on board the ISS, focusing on the behaviour of cells in microgravity. She noted that cosmonauts were trained carefully to carry out biological experiments on Earth before repeating them in space, where – as Hesuani pointed out – there is no room for mistakes. ISS commander Shkaplerov, who in February set the record for the longest Russian spacewalk to date (spending more than eight hours outside the ISS), told the conference that the main task of those on board the ISS was to carry out space research and experiments, and that of all the experiments they do, the biological ones are the most interesting. Back on Earth, Engin Ozcivici, an associate professor of the department of bioengineering at the Izmir Institute of Technology in Turkey, presented the results of research into the effect of weightlessness on bone tissue. Loss of bone density is commonly seen in astronauts following their time in microgravity, because of the lack of gravity that on Earth forces muscle and bone to work against it. A similar phenomenon is observed in people after prolonged bedrest or paralysis, but to a lesser extent. “Cosmonauts are constantly losing their bone structure because they are exposed to weightlessness,” Ozcivici told the conference, noting that humans lose an average of 2 percent of their bone density per month in space. “Two percent bone loss may not sound a lot, but if you think about manned spaceflight to Mars [a journey expected to take several years] or any other long distance space travel, you will end up losing a lot of bone,” said the Turkish bioengineer. While muscle loss – which also occurs over time spent in microgravity – can generally be regained once people are back on Earth, bone structure recovery is very slow and is not guaranteed, which is why it’s important to look for ways to prevent it in the first place, said Ozcivici. 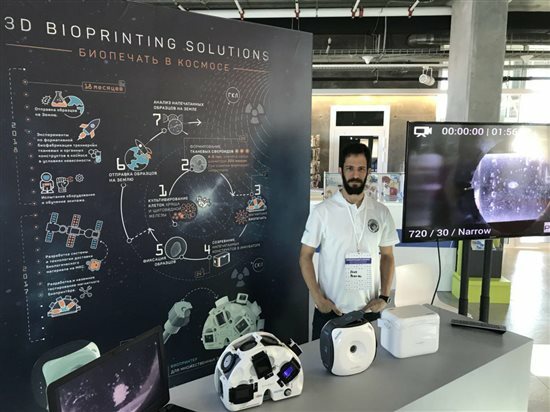 3D Bioprinting Solutions presented its space bioprinter, the OrganAut, at Skolkovo's Hypercube. Photo: Sk.ru. Musculoskeletal mechanical sensitivity – i.e., how much a person’s bone structure is affected in space – varies greatly in humans, from 0.1 percent to 5 percent per month. The deciding factor is apparently genetics, so researchers in the U.S. funded by NASA decided to carry out experiments to establish whether it is possible to identify individuals who are at a greater risk of bone loss during spaceflight. They used two sub-breeds of mice to study how chromosomes appear to regulate how much loss of bone volume they sustained during tail suspension (i.e., when they were not putting any weight on their back legs), and then how much of that bone structure was regained when they were released to run around again. The findings of biological experiments carried out in space or by scientists researching the effects of space often have just as much significance for those on Earth. “If we could learn how to counteract the devastating impact of bone loss in microgravity, the solutions could well be applied to osteoporosis and other bone diseases,” the U.S. astronaut Scott Kelly, who together with Russian cosmonaut Mikhail Korniyenko spent nearly a year on the ISS, wrote in his book “Endurance: A Year in Space, A Lifetime of Discovery,” an extract of which was published in the Sydney Morning Herald. The second series of experiments described by Ozcivici overlaps with what 3D Bioprinting Solutions is working on on Earth: using magnetic levitation to simulate microgravity. In Turkey, scientists used a commercial MRI contrast agent to levitate cells between two negative magnets. The cells were able to form clusters within 12 hours of levitation culture, Ozcivici said. 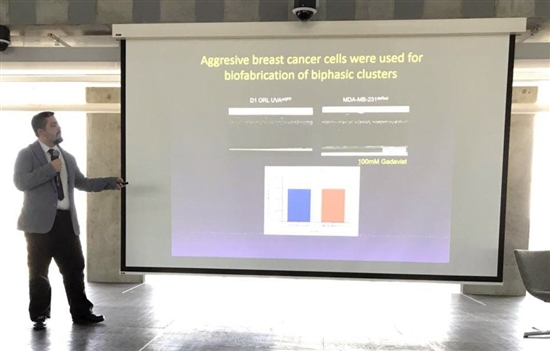 The contrast agent didn’t kill the cells, but did slow their growth, and the cells can’t tolerate high concentrations of the agents, said Ozcivici. This aspect of the research prompted keen interest from Hesuani, whose company grows cells in a nutrient solution with metallic nanoparticles added to it to make the cell tissue respond to the magnetic field. 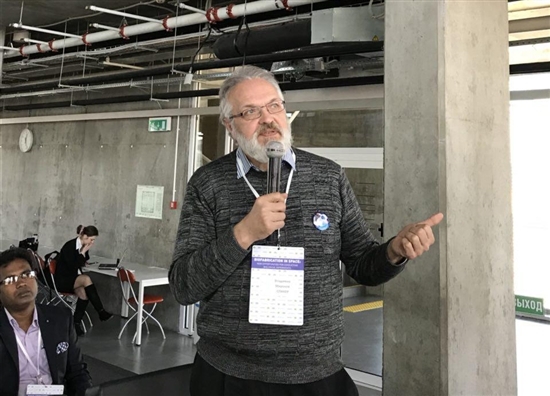 The metallic nanoparticles are also toxic to the cells, meaning that only small constructs can be made using this method, Hesuani told Sk.ru ahead of the conference. By exchanging their experience with such aspects of the experiments, conference participants will learn from each other and advance their research, the conference’s organisers hope – meaning space explorers like Shkaplerov and Artemyev can sleep easier in their micro-gravity home beyond the stars.